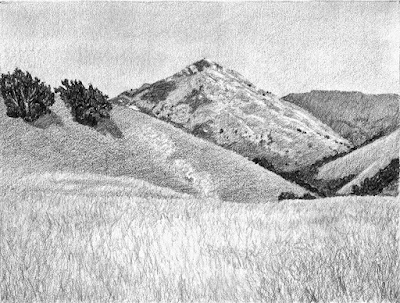 By some accounts, by both Rumsen and Esselen native peoples of the Santa Lucia Mountains, Pico Blanco is said to be the center of creation — where everything came into being. Every culture has it's own unique creation story. Every culture, community, or wisdom tradition has some story about how the world was created and how we humans, along with others, came to be. It is one critical ways we define ourselves as a group. We as individuals have our own 'creation' stories, about who we are, how we came to be, what we do, and more. These stories, for better or worse, define us. We can use them to narrow or expand our sense of who we are and what we can or can't be and do. I am curious these days about the stories I have told and currently tell myself about who I be. They range from quite limiting and narrow, to expansive and open to a range of possibilities. At this point in my life I am finding it is a good time to question the stories, especially those that lurk in the shadowy, barely conscious, parts of my being and examine where they came from and if they serve me. Perhaps one of the reasons I feel so at ease in wild nature, is I tend to shed the skin of the stories of self and more easily slip into the experience of just being, without a story. I love a good story as much as anyone. I also love when the stories fade to black and there is no separation, no words — just being.